This continued to further increase my interest. A look inside reveals that every page contains an old photo from around the Town and also a modern equivalent of the same view or scene; there are photos of the streets, shops, pubs and Inns and a great number of the other landmarks from around the area. This then-and-now connection makes the book a great read as this gives a real context to the photos. 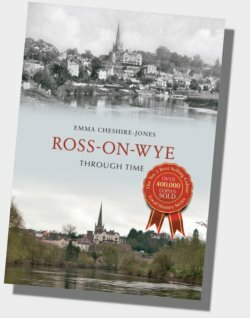 A number of the photos I had not seen before in other Ross-on-Wye history books which made this book a little different and even more engaging. Overall this book is great for a quick flick through or a longer examination looking for the features in the photos that were present then and that are still present today. Definitely worth adding to the bookshelf! Emma Cheshire-Jones is a professional photographer who works within local community groups such as Ross in Bloom and the Royal British Legion. She has a keen interest in local history and close connections with local historians through this work. She lives in Ross-on-Wye.